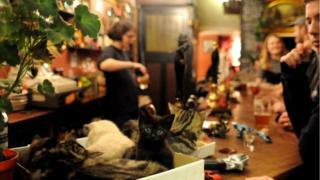 People are flocking to a pub in Bristol - not for its beer, prices or atmosphere but because it is full of cats. So what is the appeal of a bar you have to share with 15 felines? "It's my dream - alcohol and cats combined." Bethan Ingram has journeyed 60 miles from her home in Cowbridge, south Wales, to visit the Bag of Nails pub in Bristol. Attracted by publicity about its unlikely status as a "cat pub", the moggie-mad 24-year-old is here for a day out - and has not been disappointed. "I love it," she said. "A beautiful cat even greeted us on our way in. It's so nice in here." Another first-time visitor, 22-year-old Rachel Smith, from Hereford, agreed. "It's my day off and I really love cats and wanted to see the pub," she smiled, as two kittens wrestled on the bar. "It's cute and quirky, and I'm definitely hoping for cat cuddles." Image caption Landlord Luke Daniels said he loves cats because they "just do what they want to do"
Landlord Luke Daniels is bemused by the international press coverage his humble ale house is enjoying and claims the Bag of Nails is not a cat pub - it's just a pub that happens to have cats in it. Fifteen of them. But he is certainly not complaining about the scores of new visitors. "People like the cats and because it's just a fun place to be. It's a reflection of myself, to be honest," he said. The pub had lain empty for two years when he took it over in 2011 and he was determined to give it his own "individual" stamp. "So many pubs are sterile and boring and look the same. I thought, I want my pub to be different. So I filled it with toys, I filled it with music, I filled it with people and I filled it with cats." The style of the interior has been described as "shabby chic". However Luke, 44, said: "It's not. I just don't have any money to do it up. "The decor looks like it's been thrown together a little bit, but actually it's been very carefully done. I'm just a naturally untidy person." However, it's the pub's 15 cats that are proving to be the big draw. And if that number seems a little high, there used to be as many as 24 roaming about the bar. "We had a lot of cats when I was young and I thought it was the best thing ever. But recently it got a bit out of hand," Luke laughed. "So we gave some away." The cats that are left variously go by names such as Salvador, Absinthe, Pompidou and Caligula, and "apart from the odd, external influence" are all descended from Malcolm, a British short-haired male silver tabby, and solid black female Beresford, named after a former landlord. They're all one big family," Luke said. The life-long feline fancier says he is particularly attracted to cats because of their independence. "They just do what they want to do. They say dogs have owners, and cats have staff." As the landlord of an independently-run free house, Luke says he has "no brewery and no boss" and the city council are fine with the way he manages it "so long as the rent is paid". And he said a recent inspection by environmental health inspectors earned a five-star rating, mainly because no food is cooked on the premises. Even though the pub's various cats slink past the pints of drinkers at the bar, there is a distinct lack of beer spillage. Luke said: "Cats are very elegant in the way they walk. Very occasionally drinks have been knocked over, but it's just not an issue." Of course not everyone comes for the cats. Pub regular Martin Booth said: "Recently more people have realised cats are here, and perhaps that's a draw for them, but for me it's just a great little boozer." However, some disgruntled people have been sharpening their claws. A group of boisterous pub crawlers were recently shown the door for mockingly asking for "five pints of cat pee". "I wasn't in the mood," sighed Luke. And the RSPCA has grumbled about the potential harm to the cats' welfare. A spokesman said: "Some cats might not enjoy being handled by strangers, and generally we do not recommend keeping a lot of cats in one place. "We certainly wouldn't recommend drinkers sharing their favourite tipple with the cats, as alcohol is a poison which can cause them serious harm and suffering." But Luke was quick to dismiss the society's claims. "They haven't even been in to see the place," he said. "The cats can come and go as they please, so if they don't like it in the bar they don't have to go in there. "And as for alcohol being a poison, they might sniff it, but there's no way cats are going to drink booze. It's ludicrous. "Also we don't have drunk people staggering around in here - it's not that kind of pub. "The cats are healthy and they are not stressed." Luke is also especially reluctant for his pub to be categorised alongside the numerous cat cafes popping up across the globe. The world's first cat cafe is thought to have opened in Taiwan in 1998, and the craze has since spread around the world, with cafes in Paris and London attracting long waiting lists. Image caption Bag of Nails landlord Luke Daniels said "dogs have got owners and cats have staff"
Luke nearly coughed up a hairball as he described the concept as "deeply flawed". "It's treating cats as a commodity and they are not. They are individual creatures with minds of their own," he said. "I know the media has portrayed us as a 'cat pub', but we just happen to have a lot of cats living upstairs that like to come down into the bar from time to time. There's a big difference." In the meantime, Luke said he would continue welcoming the spate of new punters any media coverage attracts. "We get people from all walks of life, because we offer so many things," he said. "Our regulars like all the different beers and ales we do, young ladies come in because of the cats, and we play music on vinyl so we get a lot of music lovers as well. "The clientele is very mixed. And we don't have many rules except no dogs are allowed, for obvious reasons. "We're not a pub for everybody, but that's fine. Plenty of people seem to like it." Image caption Bethan Ingram journeyed with boyfriend Craig Trainor from South Wales to visit, joking that alcohol and cats combined is her "dream"